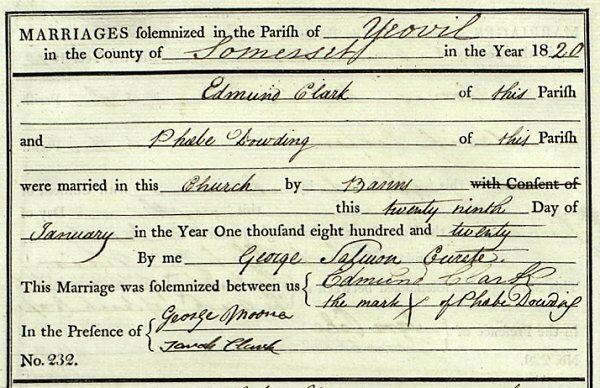 Edmund Lewis Clark was baptised on 7 April 1799 at Donhead St Mary, Wiltshire. He was the illegitimate son of a Mr Lewis and Christian Clark. Nothing is known of his early life, but by 1820 he was living in Yeovil. On 29 January 1820 he married Phoebe Dowding (1799-1874), originally from Stalbridge, Dorset, at St John's church by Banns. They were to have two sons; George (1823-1861) and John (b1825). From a later account it appears that Edmund may have been a schoolmaster in Yeovil at some point in time. In Robson's Directory of 1839 he was listed as a beerhouse keeper of Porter's Lane (widened in the 1920s to become today's Westminster Street) and the beerhouse in question was the Heart of Oak (today's Westminster). In the 1841 census Edmund and Phoebe, together with their sons, were listed in Porter's Lane. Edmund gave his occupation as an inn keeper, 18-year old George was a cabinetmaker's apprentice and 16-year old John was an upholsterer's apprentice. Pigot's Directory of 1842 listed Edmund as a beerhouse keeper of Porter's Lane. However Edmund was in severe financial difficulty and in 1844 he was declared bankrupt and spent some time in Wilton Gaol, near Taunton. 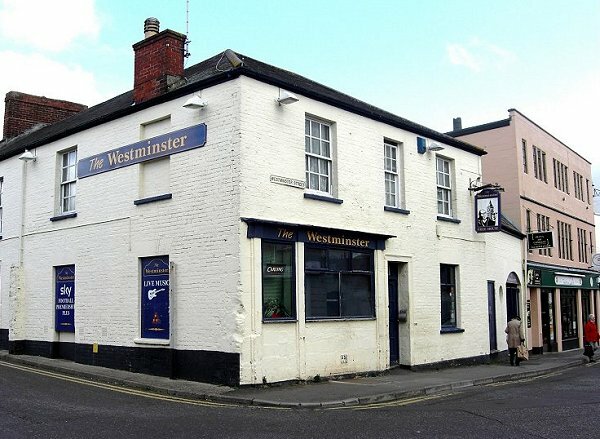 He was described as "late of the Heart of Oak Inn, Porter's alias Hewish-lane, in Yeovil, in the county of Somerset, Beer Salesman, Schoolmaster, &c."
It is not known how much time Edmund spent in Wilton but during the 1840s the family moved to London. In the 1851 census he and Phoebe were listed at First Street, St Luke, Chelsea, Middlesex, where he gave his occupation as an invalid chairman and Phoebe gave hers as a laundress. They were still in Chelsea at the time of the 1861 and repeated their occupations. Edmund died in Chelsea in the spring of 1862, aged 62. Phoebe died in Chelsea in 1874. The entry of Edmund and Phoebe's wedding in St John's marriage register. The Heart of Oak, now trading as the Westminster. Photographed in 2009.